Lesa Holstine has been blogging and reviewing books at Lesa's Book Critiques for over six years. Born in Ohio, she was a library manager there, in Florida for eighteen years, and in Glendale, AZ for almost seven. Lesa reviews women’s fiction for Library Journal and mysteries for Mystery Lovers’ Journal. Lesa's Book Critiques is syndicated through Blogburst, and reviews have been picked up by Reuters, USA Today and other news distributors. She was the winner of the 2009 Spinetingler Award for Best Reviewer. She considers two of her greatest accomplishments the chairing of the Authors’ Committee for the Lee County Reading Festival for six years, and the Authors @ The Teague program. My husband, Jim, died in February 2010, and so many of those sisters I met in the crime fiction community reached out to me. You, along with my family and my co-workers, are the reason that 2010 and 2011 actually turned into very good years for me, and I wanted to say thank you. I met Judy Starbuck at Poisoned Pen Bookstore in Scottsdale about a year before Jim died. Judy read my blog, Lesa’s Book Critiques, and recognized me. She tells me now that she spends time with me through my blog with her first cup of coffee every morning. Judy is a member of the local chapter of Sisters in Crime here in Arizona, Desert Sleuths. She introduced me to fellow members of that group, who have become friends, Roni Olson, Chantelle Aimee Osman, Deb Ledford, Kris Neri. 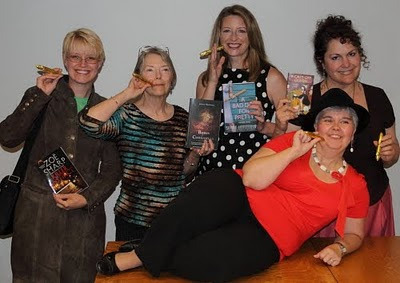 Desert Sleuths came as a group to the Velma Teague Library to celebrate the release of two of their books. And, last summer, they made me their first fan guest of honor at their WriteNow! Conference. That’s quite an honor. But, even more important, they truly made me feel like a sister. They’ve included me in lunches, dinners after programs at the Poisoned Pen. 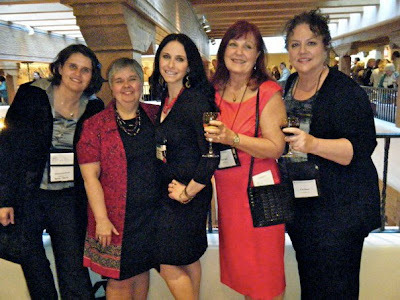 We all met up in Santa Fe at Left Coast Crime, supported friends who were nominated for awards, went to dinner, just shared time, hugs, and laughter. I don’t get to see them as often as I would like, but they’re always in my heart. Then, there are three other crime writers who I’m lucky to call friends, Zoe Sharp, Sophie Littlefield and Juliet Blackwell. I first met all three of these women when they appeared at Velma Teague. Zoe was the very first author I ever hosted for Authors @ The Teague. She’s been there three times, and I love to host her. But, I’ve also had dinners and breakfasts with her and her wonderful husband, Andy. They took me out for my first sushi meal, and poor Andy even had to show me how to use chopsticks. And, I thank them for all of the time we’ve had together in the last year. I really don’t think of Sophie Littlefield and Juliet Blackwell separately. They’ve appeared at the library together. I met up with them at a Poisoned Pen conference together, and at the Tucson Festival of Books. I follow them on Twitter, and get notes from them saying “We were just talking about you.” Seeing Sophie and Juliet, or hearing from them makes me feel as if I received a group hug. Louise Penny isn’t just the bestselling author of the Three Pines mysteries featuring Armand Gamache. Louise is a dear friend. I meet up with her for dinner every time she comes to the Poisoned Pen. We’ve shared stories, hugs, and I have a standing invitation to stay in her guest house, one that she offered as soon as she heard of Jim’s death. And, I can’t talk about “Sisters…in Crime” without mentioning four special people in the blogging community, Jen Forbus, Janet Rudolph, Maddee James and Kaye Barley. I got to meet Jen in Ohio last summer, and she’s just as enthusiastic as you’d expect if you read her blog. I finally met Janet and Maddee at Left Coast Crime in Santa Fe. Janet inspires me daily with all of her contributions to the mystery field. She hosts authors in her home, edits Mystery Readers’ Journal, and tweets about the crime fiction genre. Maddee is Xuni of xuni.com, Maddee has been there from the beginning of my blog, assisting me with it. She even offered me use of her house when Jim died. And, Kaye. Every time I receive a note from her that says “Sweetie,” I feel hugged. There’s a whole group of wonderful “Sisters” out there, Vicki Delany, Hank Phillippi Ryan, Clea Simon, Libby Hellmann, Cara Black, Deb Baker. The list could go on and on. Thanks to all my sisters for their support this year. With your support and friendship, the last year and a half has been good to me in the crime fiction world. I’ve written the chapter on mysteries for the forthcoming edition of Genreflecting. I was honored to be the first Fan Guest of Honor for Desert Sleuths. Thank you. I’ve reviewed mysteries for my blog and journals. I attended Left Coast Crime, and was honored to meet so many other “Sisters.” I can’t thank all of authors enough who take time to appear at the Velma Teague Library for Authors @ The Teague. And, now I’m even going to Book Expo America (BEA) in New York City to be on a panel. Does it surprise you to know that I’m talking about mysteries? Jen Forbus recently did a guest blog here in which she talked about finding a home in the crime fiction community. She’s right. But, it may only be when you have a crisis in your life that you realize how many “Sisters” you truly have in the mystery world. Thank you to all of you. What a beautiful piece, Lesa! I've only gotten to know you via DL, your blog & fb, but am so glad we have gotten acquainted! I look for your blog, your posts & your tweets. I always feel like I'm hearing from an old & dear friend whenever I read any or all of the above. Hugs! Kaye, I just *love* your blog too! Beautiful post. I'm sorry about your husband but so glad you have so many friends to support you. The mystery world is amazing, and the Internet has made it possible for so many people to connect. I've never met any of the people you mentioned but feel like I know most of them, especially Kaye. Keep on sharing Sisters. Thank you, Kay. It doesn't matter. I feel close to many of the people I've met online, and they seem just like friends when I finally do get to meet them. We already know so much about each other. And, I'll take every hug you send, Kay! Well, you sure know how to make someone's day, Lesa. Thank you for the mention in your post. But it goes both ways -- you have been such a supporter of us authors that it's easy to return the love. Thanks for everything you do. It is such an honor to be mentioned in your article, Lesa. My heart skips whenever I see your bright smile. It’s been a blast having you join the Sisters and you’ve made the past two years so much more fun. 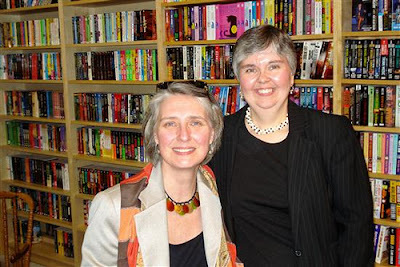 You have always been so supportive and generous to writers with your most excellent Lesa’s Book Critiques and provide an instrumental service to readers looking for worthy reads. No words can sufficiently express how much you mean to us. I think I'm hitting the right keys..can't be sure because the screen is a little blurry from the tears filling my eyes. Lesa, you darling. Do you realize how much you mean to me? And all of us? And how much difference you make in our lives? Your footprints in the sand are deep and lasting. Lesa, I can't wait to come visit. You are one of a kind. Kaye..look what you've done! What a community you've created. Remember when you weren't sure it would take? sniff sniff. When I decided to write a book the very last reason was because I wanted to make a whole lot of new friends. And that turned out to be the very best part of it. Many thanks, Lesa. See, that's what I mean. What a beautiful community - notes from Libby, Deb, Clea, Hank, Vicki, Cara. It's a different kind of friendship than you think of, but I admire all of you, appreciate your notes, your books, your "hugs." I love what you said, Vicki, that you didn't mean to make friends when you wrote a book. And, Cara? Thank you for the note about my staff. I love them. They're just great. And, you're right. They've been there for me from the beginning. It was so nice of Kaye to let me do a guest blog so I could say thank you to all of you. Such a beautiful post from such a lovely and welcome voice in the mystery reading/writing community. Thank you, Lesa. I follow you on Twitter and read your blog on a regular basis. You are so consistently thoughtful and supportive of others, it is no wonder your Sisters have been so supportive of you. Thank you, Brenda! Well, I totally agree with Jen Forbus. I've found a home here in the mystery community, and I love reading, meeting, and spending time with mystery authors and other readers. Ah, one of my two obsessions - Twitter. I spend way too much time there, but it's where I actually find out most of the breaking news. Thanks for following me on Twitter, Brenda. And, thank you for reading my blog. That's not my other obsession, but I love to share books and authors on my blog. Lesa, you know we both love you to bits. As I said, Sophie and Zoe, thank you. I appreciate the gifts of your friendship. Ah, Elizabeth. I've never had the chance to meet you, but you're there almost every day, the first one to comment on my blog. And, I didn't mention Mystery Lovers Kitchen, but you make authors and readers alike feel at home in that kitchen. Thank you. Oh my goodness, Lesa, what a lovely post. You forgot to mention, though, how much you enrich all of our lives. You are such a special member of 'sisters'... It's my honor and privilege to know you. Thanks, Janet. I'm afraid that's because I'm only looking at it from my viewpoint. And, I admire all of you, and enjoy spending time with you, whether it's in reality or virtually. I value that time and my "sisters." Lesa - look at all these sisters of yours who love you right back! Everytime I read your sweet piece, I cry. Thank you, my friend for being my friend. It's so wonderful when the internet world becomes the real world, and then goes back again. I have made friends remotely--Kaye and you being two of them!--who I am just waiting to give a real live hug to one day. Your love of books I'm sure makes these authors as grateful to have you in their lives, Lesa, as you are for them. Wonderful tribute. Wow, Lesa, what a beautiful post! It's no surprise that you're surrounded by loving "sisters" -- you open up those arms in a big bear hug, and who could resist? Seriously, you draw us to you with your openness, your smarts, and your huge smile. Thanks so much for your unstinting support, professionally AND personally! We (Sophie and I) Love YOU!!!! Hold on. I forgot something. The chocolates. Best road trip picker-upper. Ever. Keep 'em coming, Lesa. You're right, Maddee. I can't believe how much the blog has changed my life. It was so good to finally meet you at LCC. And, now Jen's working with you. Small world, isn't it? Kaye, isn't it wonderful? I can feel all those hugs right now! Thanks again! Someday, Jenny! You're right. The internet, in some ways, has made friendships possible. That's the joy of it. I'm sure we'll meet someday. Whether it's a good review or just an OK, one, Juliet, you know how much I support the authors. I'm so in awe of what you do, first with the creation and writing, then with all the promotion. And, you and Sophie always manage to appear joyful, no matter how you might be feeling. Hugs to both of you. Chocolates! Of course, Libby! What would an Authors @ The Teague program be without chocolates for the authors? I have two Authors @ The Teague mugs sitting on my table right now, ready to give them to Earlene Fowler and Carolyn Hart in an hour. hi lesa - what a very beautiful post. So moving and so true. What would we do without our Sisters? How I value you, my friend. Thank you, Louise. I hope you know how much I treasure your friendship. But, for you, it's not chocolate, is it? Gummie bears all the way! I'm a little behind on my blog reading, but I just had to say, after reading your post, "Hurrah for SinC!" You are so right about how we truly are SISTERS! Thank you so much for sharing your touching story. Thank you, Coco. Isn't it wonderful to have such supportive "sisters?" It's made a world of difference to me.